The quote above is plain and simple, yet so many of us take it for granted. Want to be fit? Are you eating well and working out on a consistent basis? Want to play an instrument? How often do you practice? What else do you want to have in your life? Have you consistently been taking the necessary actions? I’ve pretty much summed up what is required of you in order to have the life that you want. You can now stop reading this article and contemplate what you need to do consistently. However, if you want to understand the power of consistency and how to manage it in your life, read on. If you were given the choice of £1,000,000 or a penny that would double its value every day for a month, which one would you go for? If you chose the former you would’ve missed out on an extra £4,368,709.12. This is the power of compound interest, that Albert Einstein famously stated as ‘the eighth wonder of the world.’ In finance, compound interest is when you earn interest income on top of your interest income, which results in exponential growth. This is why after a month your 1 pence turns into £5,368,709.12. Of course, finding a penny that’ll double its value every day is far-fetched (or is it? ), but the compounding effect is far from absurd. When we adopt the compounding effect on your personal development, the key to unlocking the effect is through small improvements over a consistent amount of time. 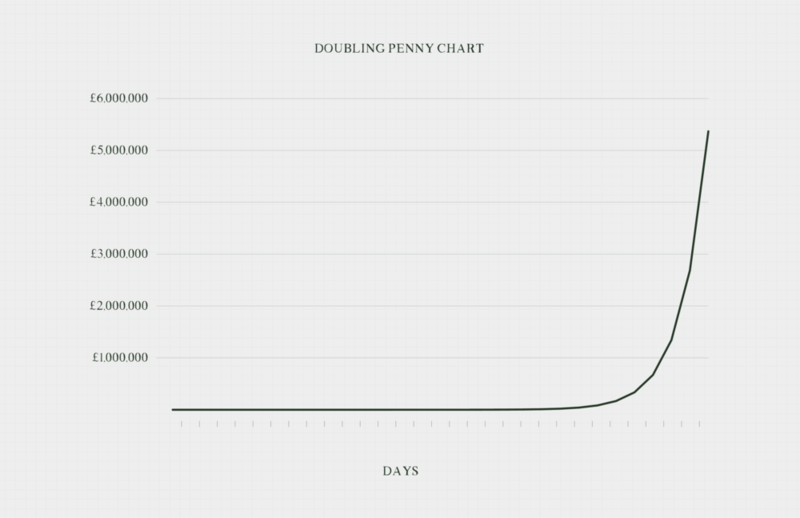 Similar to the chart above, your small daily disciplines will feel minuscule and you won’t be able to tell a difference, but those small improvements will pile up on top of each other and eventually you will unlock the compounding effect. Consistently repeated daily actions + time = unconquerable results. If you want to unlock the power of consistency, it’ll take a lot of patience and discipline, but eventually, you will reap extraordinary rewards. If you have no idea where to begin, read on and hopefully you’ll have a better idea on how to start. Staying consistent is such a simple rule for life, yet it can be the most difficult to accomplish. Life takes over and you're forced to miss a day of consistency. It happens. There is no one on this planet that is consistent for every waking moment of their life. Even my track record can be a little sporadic at times, and I pride myself on my consistency. One of the most important mindsets to adopt when you begin your journey is that you will inevitably fail. Sounds a bit dire but it’s important that you realise this early on. Otherwise, when you do miss a day you may be disheartened by the ‘failure’ and remove yourself from the process entirely. So what if you had a minor set back? Who cares? What’s important is how you react from it. Pick yourself up and commit to remaining consistent again. The more you do this, the more successful you will be in all aspects of life. If you’re in the millennial bracket, you probably have no clue who Jerry Seinfeld is, if you do, you probably know him as the host for ‘Comedians in Cars’, but before that, he was hailed as a comic genius that created the popular American TV show, ‘Seinfeld.’ He credited his success to one simple phrase, “don’t break the chain.” When asked what his writing habits were, he mentioned a process of marking an ‘X’ in his calendar on the days he completed his writing assignments. After doing this for a few days he noticed a chain of X’s appearing on his calendar. It got to a point where the chain became so long that the idea of breaking it motivated him to continue his tasks. ‘Breaking the chain’ incorporates the theory of loss aversion, where individuals are more focused on avoiding making a loss than acquiring equivalent gains. Instead of marking a complete day on a paper calendar I’ve opted for the more modern approach - an app on the phone. Below are a few examples of apps that I’ve used in the past and would highly recommend. Works for both iOS and Android. This is the tracker that I’m currently using. 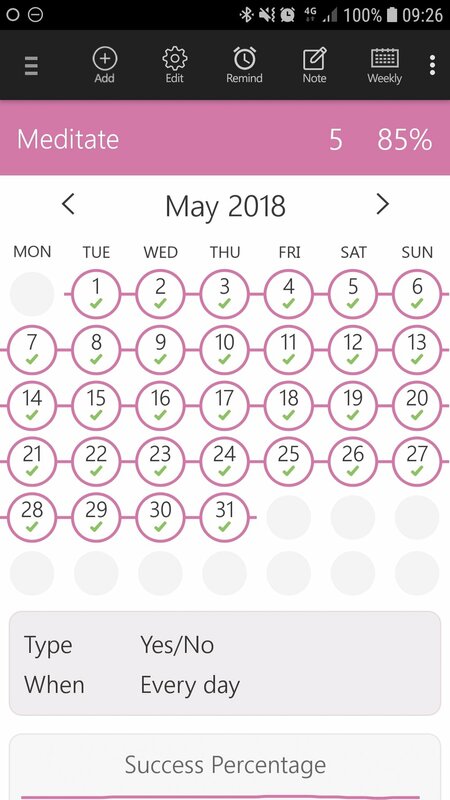 If you upgrade to the premium version you’re able to track up to 100 habits. It incorporates inspirational images and discussion forums to keep you motivated. iOS only. Before Habitbull I was using Streaks. 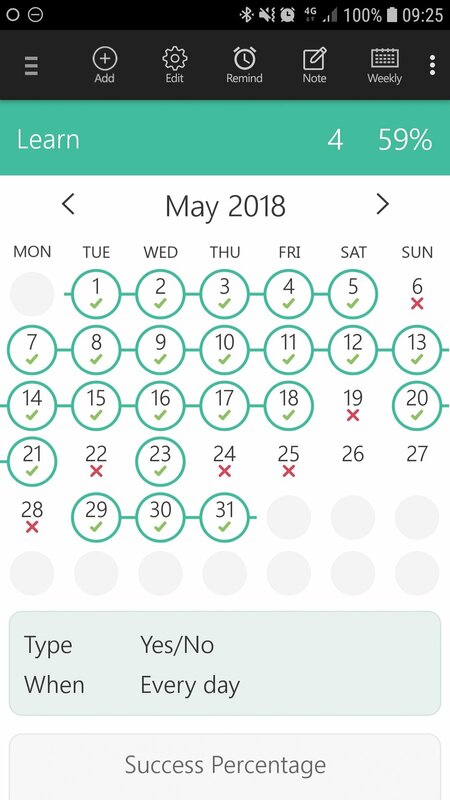 The reason I moved on was that it only worked on iOS and I could only track up to 12 habits max. It’s beautifully designed and I would recommend it if you’re only tracking a small number of tasks. Works for both iOS and Android. Before Habitbull and Streaks, I was using Coach.me. I moved on because I was looking for a different interface. This app is heavy on the community side and if you’re in need of a personal coach you can easily find one here. You’ll notice in the images above that I’ve not remained consistent with all my tasks. As I mentioned before, life happens. There were days where I couldn’t find time to complete a specific task and I had to mark it down as an ‘X’. The time where I broke a chain of 200+ days was soul destroying, but I knew I had to pick myself up and start working on the chain again. “Show me your calendar and I will tell you your priorities” - Unknown. Tracking your consistency is all well and good, but I find the most important step to help you start is to schedule in advance a dedicated amount of time for your tasks. Want to read 30 pages a day? Why not schedule in 60 minutes of reading after you wake up? Want to practice an instrument for 1 hour? Why not dedicate every evening at 9 o’clock for an hour of learning a new instrument. An example of how I schedule my time dedicated to learning a new skill. Going through your calendar and scheduling your tasks will help you manage your time and understand how effectively you use it. You’ll soon realise where most of your attention goes to, and you’ll be able to see if there are any moments during the day where you are not spending your time wisely. Recommended reading: How to take control of your time. “Perhaps happiness is always to be found in the journey uphill, and not in the fleeting sense of satisfaction awaiting at the next peak.” - Jordan B. Peterson. I hope by now you have begun to understand the importance of consistency and how to begin your journey. If there’s one thing I hope you take away, I hope you learn to enjoy the process. Having your eyes fixed on the prize and what you could be is inspirational, but don’t forget to appreciate what’s going on now. Remember, consistency coupled with time will unlock exponential results, but remind yourself that it’s not going to happen overnight. There will be occasions where it will get monotonous and perhaps even boring, but it’s important to persevere. Once you begin to fall in love with the process it’ll make everything easier. If you’re looking for some inspiration to keep you consistent, sign up to my 1-minute report card. I am on a mission to learn and document every practical skill to better my life, once a week I update you on my progress of learning something new and show you my entire process.